Carthage Mills' FX®-HSE Series of nonwoven geotextiles are specially designed for a wide variety of applications in the environmental market. They offer immediate and cost-effective solutions for many of the unique challenges found in these types of applications. 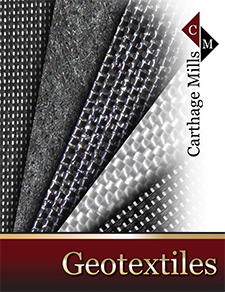 Carthage Mills' FX®-HSE Series of nonwoven geotextiles are construct-ed of 100% polypropylene staple filaments that have been needle-punched and heat-set for stability; and are chemically stable in a wide range of aggressive environments found in and around environmental applications. Carthage Mills' FX®-HSE Series of nonwoven geotextiles exhibits high durability with excellent resistance to puncture and tear, yet easily conforms to the ground and site irregularities for trouble-free installation. Meeting the strictest of Codes and Regulations, the FX®-HSE Series of nonwoven geotextiles is manufactured such that the Mass Per Unit Area is reported as true “Minimums”; thereby assuring a thick structure for the long-term protection and performance of structures like impermeable lining systems. SEPARATION and SOIL RETENTION: With superior soil-retention the FX®-HSE Series prevents dissimilar materials from inter-mixing - critical in the collection of liquids in landfill applications. FILTRATION and HIGH PERMITTIVITY: High permittivity properties provide high water/leachate flow rates. STRENGTH and DURABILITY: Provides excellent resistance to puncture and installation damage, and adverse site conditions; assuring immediate protection of lining systems. LATERAL FLOW of GASES: Assuring a clog-free outlet for gases to escape to and through venting systems is critical in the long-term success of the landfill. CHEMICALLY STABLE in HARSH CONDITIONS: Stable within a pH range of 2 to 13. The products below are not listed on the Series Profile or Series Data sheets. Note: Not all available products are listed above. Please call or email with any questions and/or Technical Datasheets for your specific project needs.